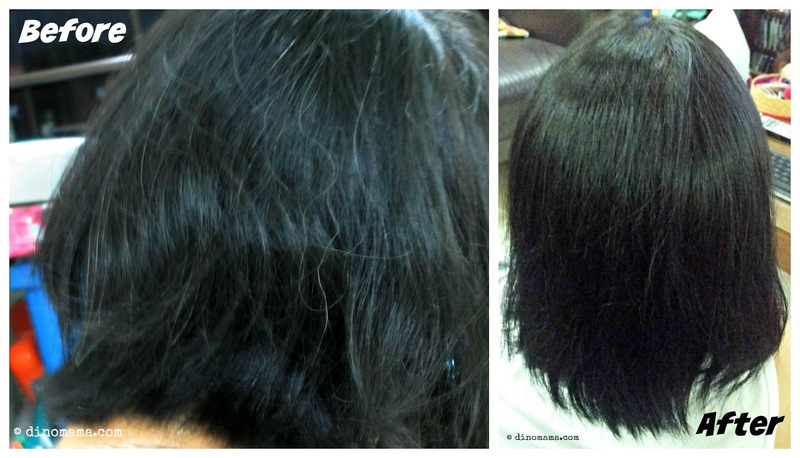 Liese Blauné Treatment Cream Color - Best DIY Hair Dye for Gray/Graying Hair EVER! Ever had moments where you are doing a last minute check of yourself in the mirror before stepping out of the house for work or for a function and you find a strand of gray hair standing out like a sore thumb on your beautiful hair? 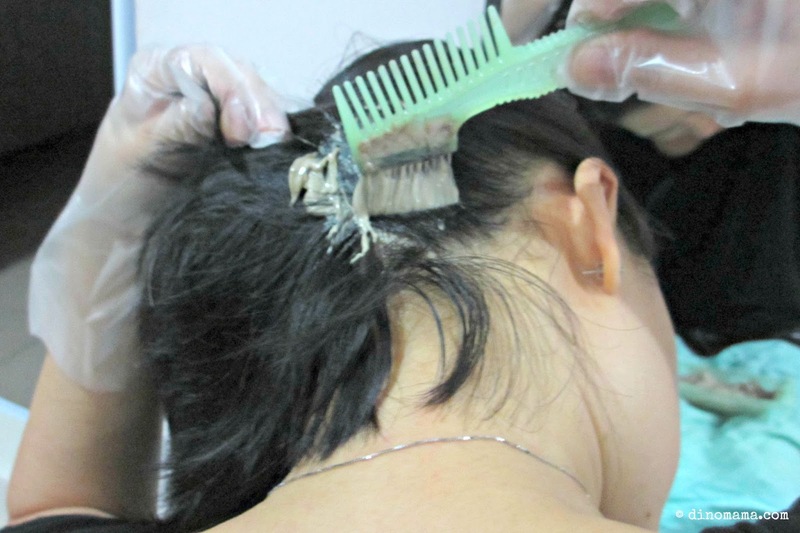 Well, I have had such moments too but instead of plucking them out like some would, I choose to ignore it since my black hair is able to cover up the gray ones. 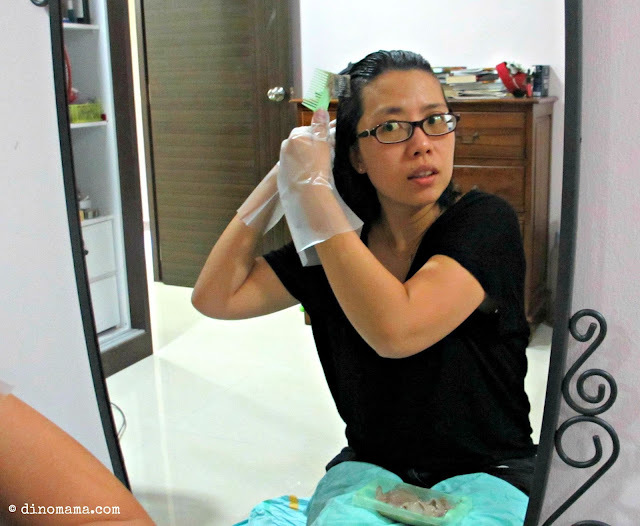 I used to frequent salons many times in a year where my scalp and hair were given the top notch treatment, including the coloring of my hair. However, since Mummyhood started almost a decade ago, these trips are non-existent except for a quick cut, wash and blow drying hair job. Sitting in a salon for a minimum of 3 hours for the full course is something that I cannot afford, time is precious for me and I'm always on a tight schedule. 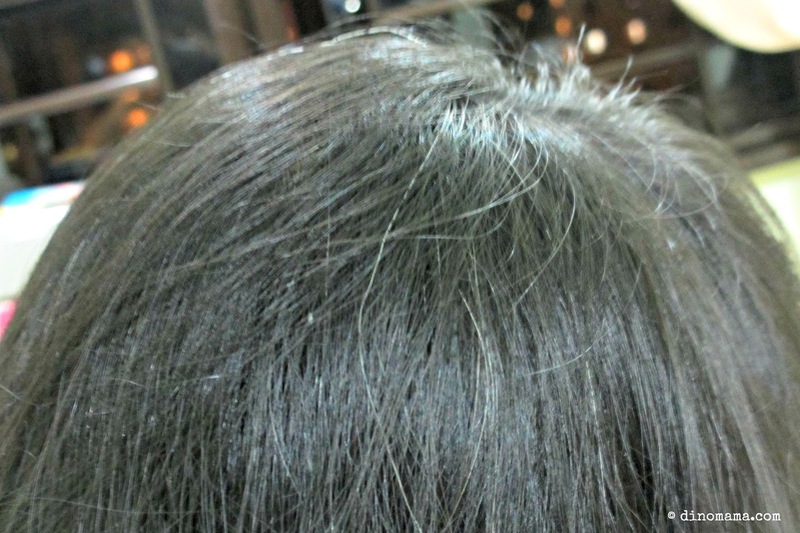 So now, my hair may look soft and healthy but upon a closer look, you can see that the ends are dry and coarse with grays showing up almost every where. By cutting out salon trips, I have started to use DIY hair coloring or hair dye products from a few well-known brands but after a few years I wasn't keen on spending SGD20 to get another box to try because frankly most of them are not capable of fully covering the grays. Plus the strong-till-almost-choking ammonia smell that stays with me for days is not something that I look forward to. On top of that, the harsh chemicals in the dye dries my hair further and I will need to visit the salon or purchase hair nourishing products to apply on my brittle hair. I would have left my hair alone in its current state if not for a casual remarks made by DinoBoy a few weeks ago while we were sitting on the sofa chatting. 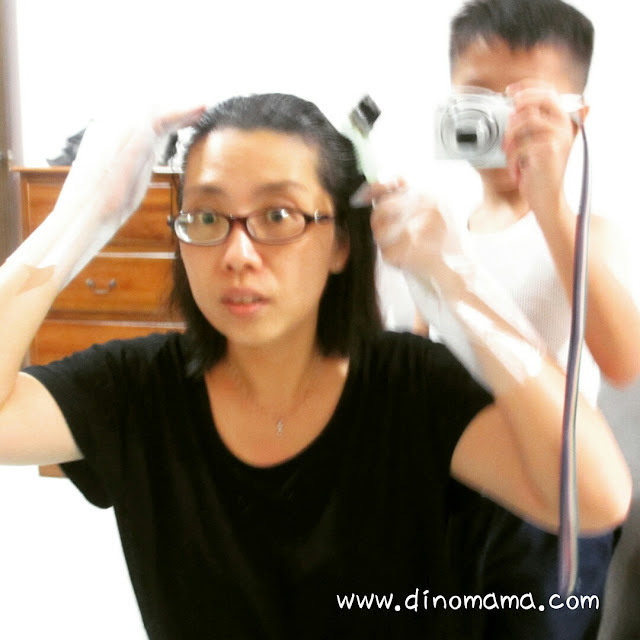 He suddenly looked at me and said "Mum, how come I can see many white hairs on your head? You are not old like grandma but why so many white hairs?" Aye, even my 9 year old has his opinion about my grays It is time to go hunting for hair dye. 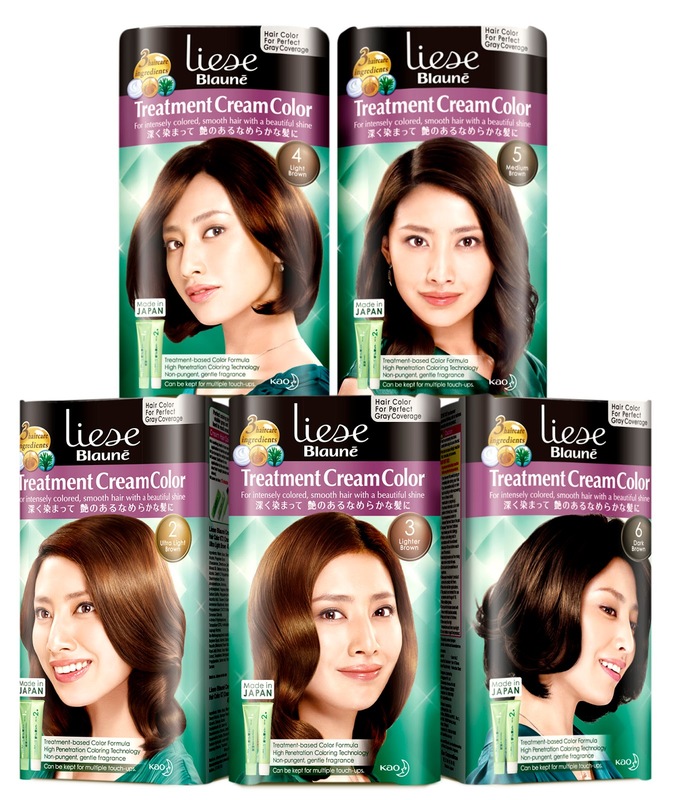 I asked around and was introduced to Liese Blauné Treatment Cream Color, which comes in five brown shades that are optimized for deeper coloring penetration. 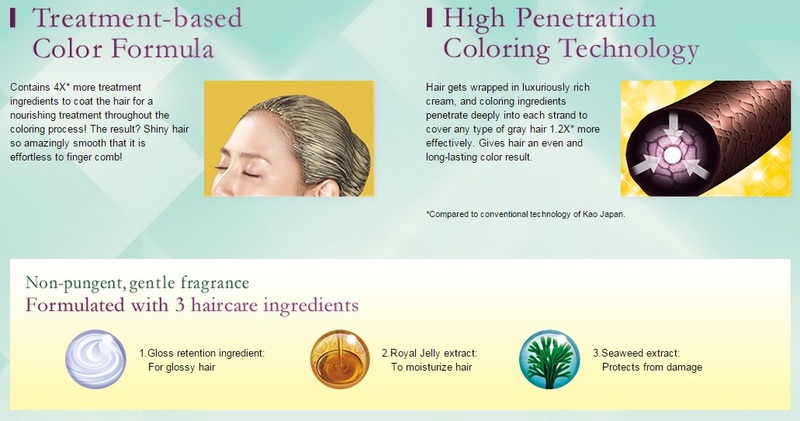 It is specially made for Asian’s thick and coarse tresses. I couldn't decide which brown shade I want because these are not the usual colors I have tried before and I'm pretty excited how it will look on me. I finally chose Light Brown because I wanted to see if the lighter shade will be able to cover all my grays. When I opened up the package, I was surprised that there were no bottles of cream or solution for me to pour, mix and shake. Instead, there were only 5 items in it. 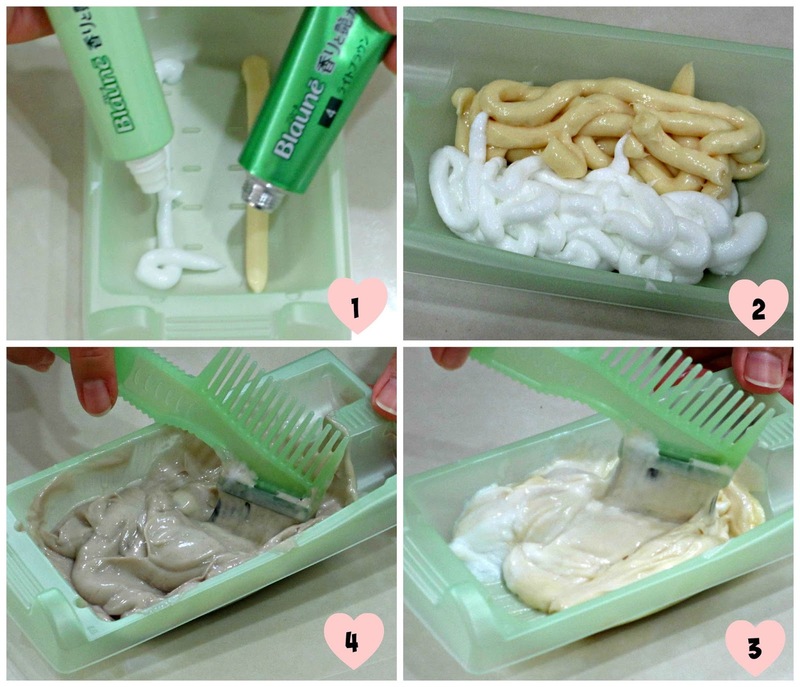 Preparation of the hair dye was so simple, I just had to squeeze the 2 tubes of cream onto the tray and mix them up! And you know what? There was no choking ammonia smell! Definitely a plus point for me! When it was done, I sat in front of our bedroom mirror, wore the gloves and started to put the mixture onto my hair. I was in for another surprise, the cream mixture was easy to spread and because of its more than 60 per cent treatment base that conditions my hair while coloring, I was able to comb it through my hair without much resistance! You must be wondering how I managed to take photos when my hands were obviously busy? Well, I had a little helper - DinoBoy, who was curious about this whole hair dyeing thing. He looked at the cream mixture and wondered out loud that "It does not look like BROWN to me." He wanted to see how I dye my hair myself and see it "turn brown". Lucky for this little helper, I could dye my hair with a peace of mind and be assured of his ability to take great photos for me... ok, except for this one, because he felt so tickled by my “stunned look” in the mirror that he was laughing while snapping away. I was concentrating ok! Hair dyeing is a serious matter. After everything was done, I had to wait for 15mins before I was able to wash off the hair dye. I couldn't do anything, not for the fear that the cream mixture would slop and drip down from my hair but because I'm was almost as blind as a bat without my spectacles! I couldn't even play games on my mobile phone, that's how "blind" I was. Luckily I had DinoBoy's company, chatting with me and helping me keep track of the time. At last, 15mins was up and off I went to rinse the hair dye off and shampooed my hair. It was an easy job too! After a minute or 2 under the shower, the water came out clear. Look at my hair now! When I asked DinoPapa and DinoBoy about my hair, they said it looked very silky and smooth and they could see the brown shade too. Most importantly, all my grays WERE GONE! This is really quick and fuss-free with only 4 steps to achieve amazingly dark, smooth and luscious locks with a spa level finish! 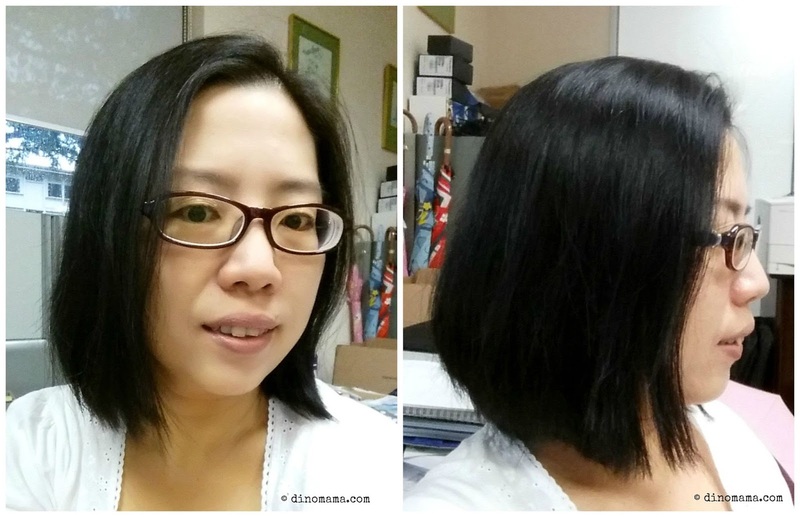 My coarse, dull and frizzy hair became shiny, relaxed and re-hydrated. Thanks to Liese Blauné Treatment Cream Color, which contains 3 hair caring ingredients - Gloss retention ingredient (Lanolin acid), Royal Jelly extract and Seaweed extract! I am not kidding you, just take a look at the photo below. My hair was so soft and smooth that I couldn’t stop touching it. You know the feeling of your hair after spending 3 hours in the salon? The fluffed up, blown to perfection, silky & smooth hair? I got that too and I only spent a fraction of the time in the comfort of my home to achieve the same result. The Light Brown tone I chose earlier? As you can see, it has covered up my grays perfectly well! I am very impressed with Liese Blauné Treatment Cream Color and retailing at only S$15.90, it does not burn a hole in the pocket. Another amazing thing to highlight is that the product can be kept for 1 – 3 months for multiple touch-ups even after opening! More savings for me, for us! Overall, I am glad that I chose to use Liese Blauné Treatment Cream Color to dye my hair because besides the easy application for dyeing, my hair was treated & conditioned at the same time. The result also gave a perfect gray coverage as indicated in the package. Specially for August 2015 ONLY in celebration of Kao Singapore’s 50th anniversary – price-off of 31% from $15.90 to just $10.90! Now that I have the perfect hair color, a trip to the salon for a quick hair cut will give me a perfect hair that every one will envy. 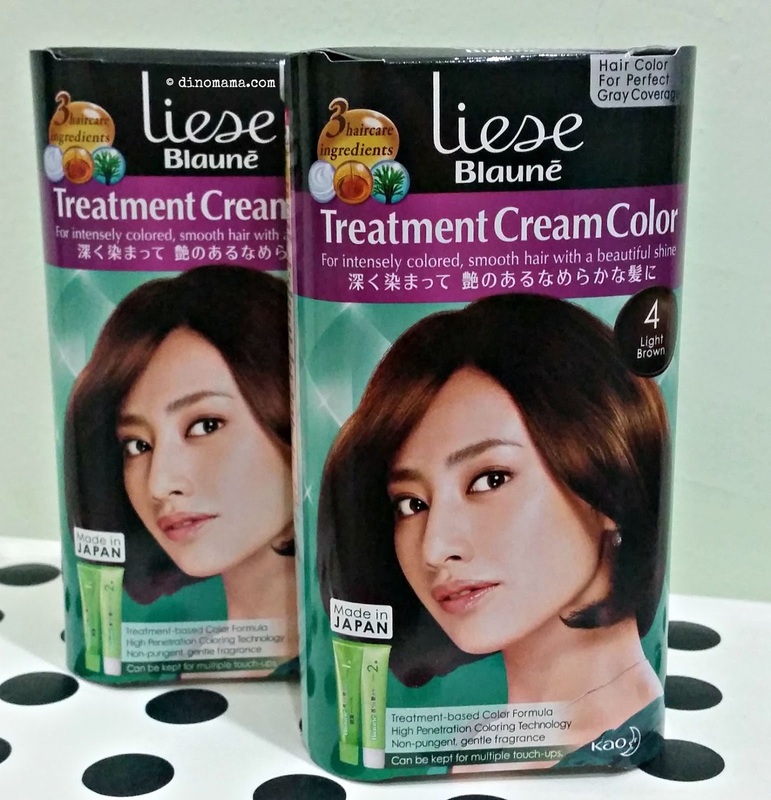 Liese Blauné Treatment Cream Color is available at all leading pharmacies, personal care stores, and supermarkets. Disclaimer : We were compensated and also received 2 boxes of Liese Blauné Treatment Cream Color for the purpose of this post. 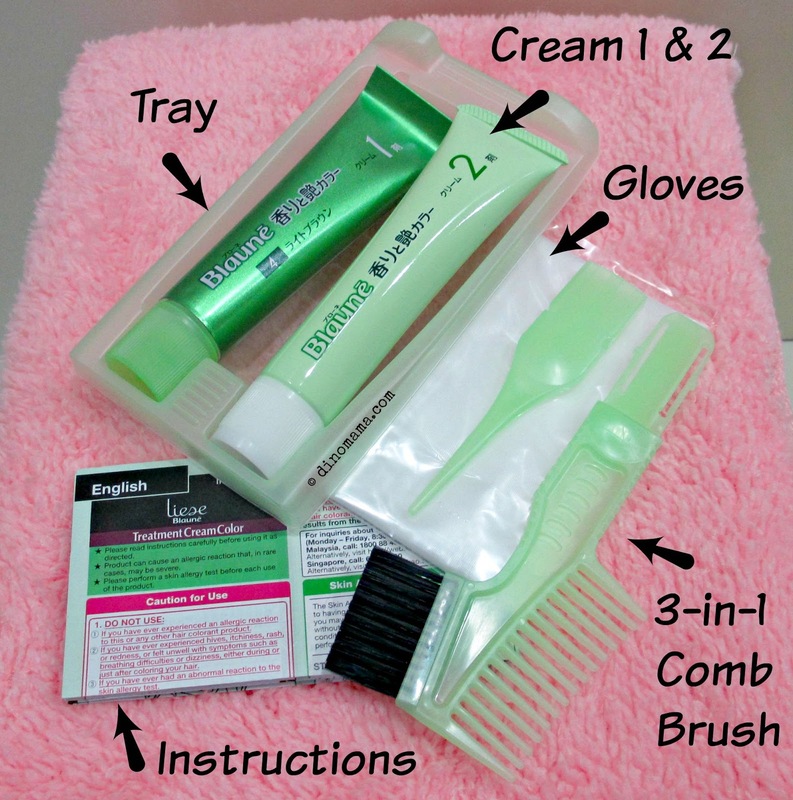 All opinions are 100% ours based on the usage of the DIY hair dye product and all photos in this post unless otherwise credited, are copyrighted and belongs to the DinoFamily, you may not use any of the photos for any purposes without seeking our approval.